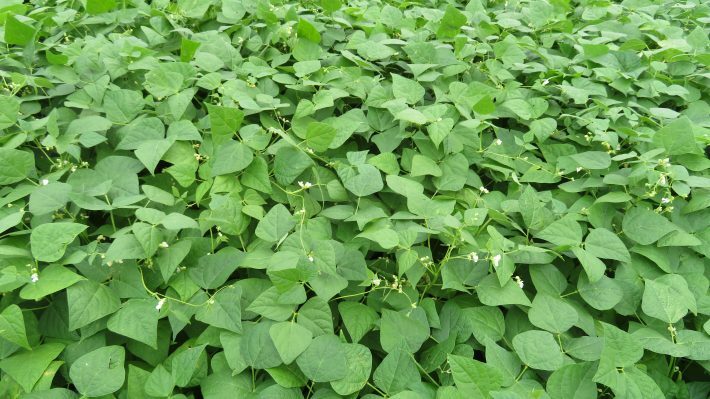 The total amount of dry edible bean acres was higher in 2017 than in 2016. The number of insured acres of white beans in 2017 was 60,363 ac, up significantly from 46,194 ac planted in 2016. Coloured bean acres, however, were down overall, totaling 56,518 ac in 2017 compared to 60,668 ac planted in 2016. 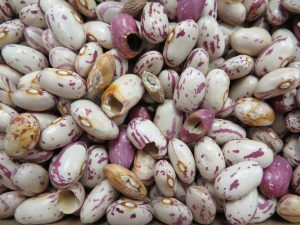 Acreage was reduced in each of the individual coloured bean market classes except cranberry beans, which increased from 9,799 ac in 2016 to 13,196 ac in 2017. In total, there were 116,881 ac of dry edible beans in Ontario under crop insurance. Spring conditions were wet across the province. Most areas saw rain approximately every 3rd day through the end of May, making it difficult for some to achieve the ideal planting date of June 1st. Edible bean growers on lighter ground, particularly through Perth and Bruce Counties, were busy planting in early June but many growers were still catching up on soybean planting that had been delayed by wet conditions. Pounding rains on the 5th of June in Middlesex County caused some issues with emergence. Planters were rolling in many fields during the weekend of June 11th, but some acres were not planted until July and others were left unseeded through eastern Ontario. In spite of the wet spring and late planting, most beans were planted in good conditions. Later plantings actually lacked moisture in some areas. 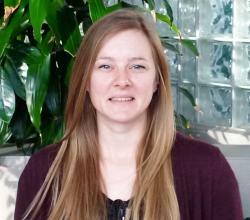 Some replanting did occur across the province, but not more than what is typical for dry edible beans in Ontario. Issues with rain continued into late June. Although significant losses were kept to a minimum, there were heavy rains on June 22-23 throughout much of southern Ontario. Around 6” of rain fell in Bruce and Grey Counties, causing flooding and standing water. Dry beans in these areas developed root rot symptoms as a result, and some plant stands were reduced. Weed control appeared to be normal to good in 2017, although excessive moisture in some places may have reduced the length of residual activity of herbicides. Variable weather conditions also made it a challenge to apply post-emergence herbicides at the appropriate time. The prolonged wet conditions later in the season resulted in some weeds germinating later, beyond the window for herbicide application. Figure 1. Seed loss caused by white mould. present in a number of fields across the province, but fungicides were generally applied at the appropriate timing to prevent significant bean quality issues. White mould pressure was very high because of prolonged wet conditions, and many growers opted to apply fungicides twice to protect the crop. It is difficult to estimate the yield impact of white mould in 2017, but pod and seed abortion were observed in individual fields where white mould was present (Figure 1). Questions arose about the opportunity to control both anthracnose and white mould with one fungicide pass. Studies led by Chris Gillard have shown that strobilurin foliar fungicides are most effective at controlling anthracnose compared to other active ingredients, and there is little difference between the various strobilurin products. There are a number of products registered for white mould control, and Gillard’s work shows that fluazinam and fluopyram + prothioconazole also exhibit suppression of anthracnose. However, if anthracnose pressure is moderate to high a foliar strobilurin product may be warranted. Both diseases are best controlled with foliar fungicides applied between first bloom to 20% bloom. Where disease pressure is high, sequential applications can provide good return on investment, and the second application should be made at full bloom. Disease issues that appear to be bacterial brown spot continue to be reported on adzuki beans. Symptoms include lesions on stems, and broken stems. Leafhoppers typically thrive in dry conditions, but in spite of the wet year they were observed at threshold levels in late June. Insecticide seed treatments provide early season leafhopper control, but at this later stage foliar insecticide applications were warranted and many fields were sprayed to control populations at threshold. In addition, tarnish plant bug were observed at threshold and sprayed in some fields, particularly in adzuki beans. Western Bean Cutworm (WBC) continues to pose a significant risk to dry edible beans in Ontario, and proves to be a significant challenge to manage. 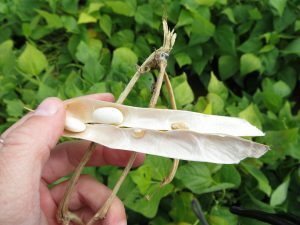 It is recommended that edible bean growers have two WBC traps in each field, and begin scouting for pod damage once 50 moths are trapped. Current recommendations are to spray when pod feeding is observed. Larvae typically begin feeding 10 to 21 days after peak flight, and feed for about 30 days. They hide in the soil during the day and feed on new pods each night so registered foliar insecticides should only be applied when pods are present, and good coverage of pods should provide effective control of actively feeding larvae. Figure 2. WBC feeding on seed causes increased pick. It is extremely difficult to find WBC egg masses or larvae in dry bean fields. It can also be difficult to determine the extent of pod feeding under the leaves of the crop. In fields scouted weekly by University of Guelph and OMAFRA this season, there were cases where only 0.01% pod damage was found in-season, but scouting after leaves had dropped revealed higher levels of damage. Up to 1% pick was reported to be caused by WBC damage in harvest samples from these fields. WBC damage can lead to pick caused by feeding directly on beans (Figure 2), or by discolouration of beans exposed to air through WBC holes in pods, particularly in cranberry beans (Figure 3). 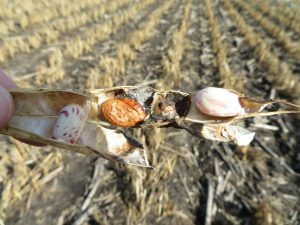 Bean dealers reported that most truck loads had some WBC damage if they came from areas where the moths were being trapped in high numbers. Research efforts are underway to better determine how to predict if a field is at risk of economic WBC injury. Figure 3. 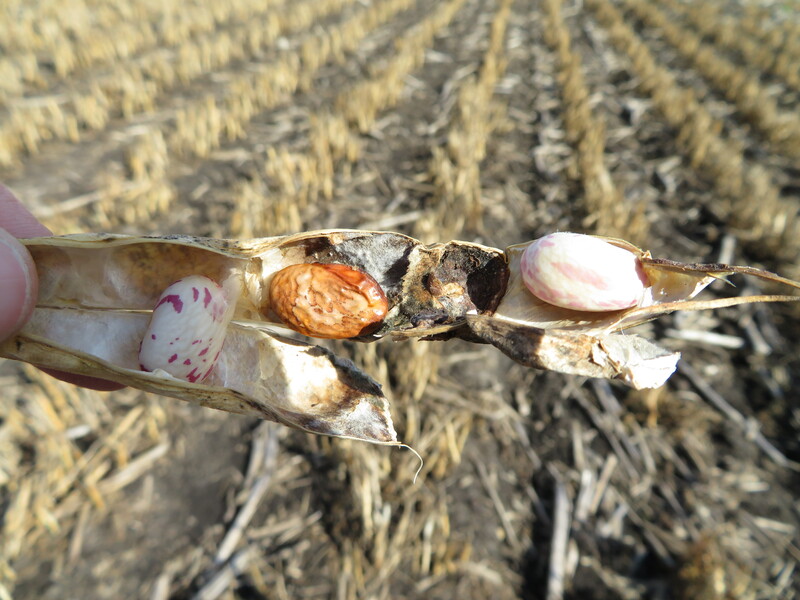 One cranberry bean (yield) lost because of WBC feeding, and another bean discoloured by exposure to air through WBC feeding hole. Seed quality issues and increased pick are the major concern with WBC feeding. Harvest was delayed this year because of late planting and rain at the end of the season. Very few beans were delivered in August, and by mid-September it was estimated that fewer than 10% of acres had been harvested in most regions. Late September and early October were quite warm; many acres were harvested and a large percentage of acres were desiccated during this time. Harvest continued well into October across many bean growing regions. 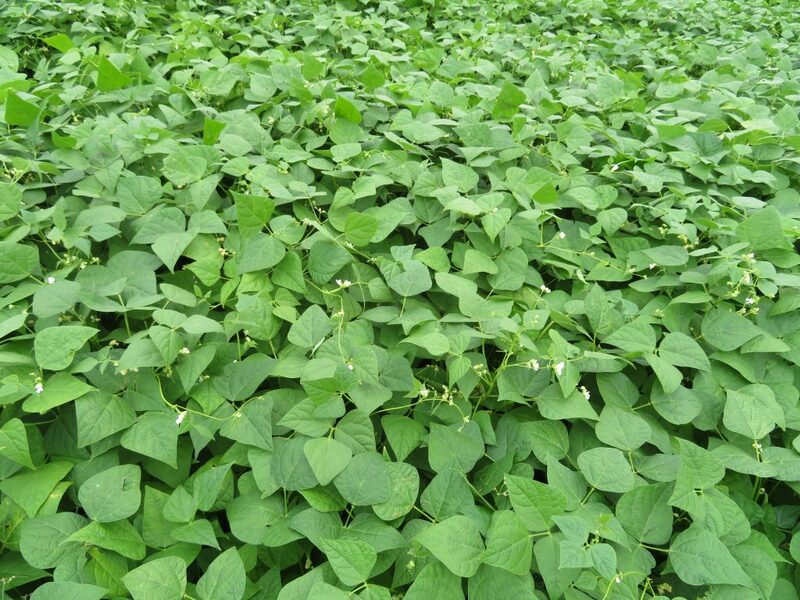 Late harvested beans had high moisture, but most edible beans came off at average to dry moisture levels. Some dealers reported high cracked seed levels in white beans, but overall cracks and splits appear to be average. Edible bean yields were average to above average. Cranberry bean yields were reported to be high on many acres, and some edible bean acres in Middlesex yielded more than soybeans. There are reports of poor black bean yields, which are likely related to accounts of poor black bean emergence.